For my 21st birthday I got a shotgun which I love taking to the clay pigeon club for a little play! I'm pretty bad at it but I think it is so much fun- plus it is a great opportunity for you to get your heritage fashion on (I also did a post on what to wear shotgun shooting here). 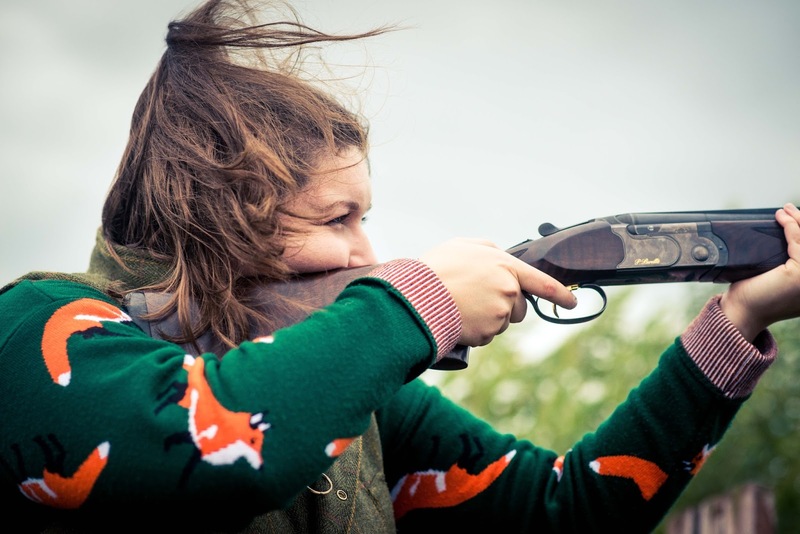 I think shotgun shooting is great fun and there is definitely been a surge in shotgun's popularity recently with all female groups being shown on mainstream tv (Countryfile! ), but here are the reasons why I think YOU should try shotgun shooting- especially if you're a girl! 1 - It's Easy To Try Out! I think the biggest thing that puts people off trying shotgun shooting is that they think it is difficult! It's really not! There are loads of different clubs out there which offer taster sessions. Taster sessions mean they supply everything: the guns, cartridges, etc. You just need yourself and some awesome shotgun fashion! Just search for clay pigeon shooting near you! People also think that shooting is for posh people! Sure there are posh people but it is genuinely for everyone! Shotgun shooting is for girls too! There are loads of girls in every shotgun club, a lot of ranges do Ladies' Days and there are even a few female only clubs out there! I think there is a massive advantage to being a girl in a boy dominated sport- there are generally a lot less girls at competitions so that means us girls have a better chance at winning! 4 - There's No Killing Involved! I think that a lot of people associate all types of shooting as hunting and killing things, but it's not! The sport of shooting is completely different from hunting and there is no killing involved. In rifle we use paper (or electronic) targets and in shotgun we use clay targets! 5 - It's Not Too Physically Demanding! I think shooting is a great sport for people who don't want to work up a sweat! It can take it out of you physically over a long period of time but it's not about running, sprinting or swimming! Instead shooting is a mentally challenging sport, it takes concentration and when you start, a willingness to listen and learn! If you decide to stick at shooting you will notice it will improve a variety of skills such as: hand eye coordination, aiming, controlling your breathing, relaxation, visualisation, gun safety, discipline and will intriduce you to a whole new social circle! 7 - To Try Firing A Gun! Let's admit it, it's kinda cool to try firing a gun just once! And don't worry about the recoil, if you hold the shotgun the correct way then there is practically none! There you have it, 7 reasons why you should try shotgun shooting. What do you think of them? Have you ever tried shotgun shooting before? Let me know down below!